In the 9th Century, Emperor Seiwa ensured that his army and private guard were trained as highly skilled combatants. The lineage of classical Daitō ryū Aikibudo classes taught by Shihan Medhat Darwish extends to the martial art practice in which these samourai engaged. Within those ranks, the samourai Minamoto Yoshimitsu advanced the practices of this martial art. Yoshimitsu examined the bodies of fallen soldiers and discovered the points at which joints met. His observations and additions not only perfected the art, but he gave it attributes which are inherent to today’s practice in Daitō ryū Aikibudo classes. Minamoto’s samourai descendants took on the name “Takeda”, and so the name and the art became linked through the centuries. While Minamoto’s family kept the art secret, Japan’s modernization compelled his descendants to share their secrets. Samourai were discouraged from presenting themselves to be warriors through laws, edicts and changing attitudes in the 19th Century. What had been a symbol of Japanese honor and fortitude began to die out, and with it the martial arts they practiced. With a desire to preserve the Daitō ryū forms, Takeda Sōkaku began traveling throughout Japan’s dojos to teach them. Sharing his knowledge to Japanese martial artists was essential, but it was his third son, Takeda Tokimune, who further expanded its practice. On February 7, 1981, he demonstrated this art during a national broadcast of Japanese television. Takeda Tokimune evolved his father’s practice into what are modern Daitō ryū Aikibudo classes. Within Daitō ryū Aikibudo classes, students learn a philosophy of mindful movement and self-cultivation. While this philosophy is what is taught in all classical martial arts, Daitō ryū artists practice movements which become smaller to the point at which they are imperceptible to the untrained eye. Effective Daitō ryū Aikibudo classes fundamentally refine one’s presence as a weapon. In essence, the coalition of ones body and mind into a present situation extends ones ability to become competent, not only within the classes but throughout any situations one may encounter. Like a matador allows a bull to use its energy against itself, so a practitioner conserves his or her presence during a fight. 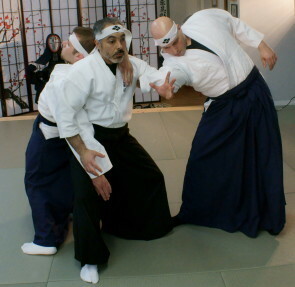 Using the joint-locking and striking techniques that samourai first learned allows the practitioner to conserve and use only necessary energy. Like a sword smith refines a weapon, so too will Daitō ryū Aikibudo classes refine you.